last to last week my laptop was not feeling well so I decided to format it and reinstall vista and all software. 1) The remote computer is running a version of Windows that is earlier than Windows Vista. 2) The remote computer is configured to support only the RDP security layer. 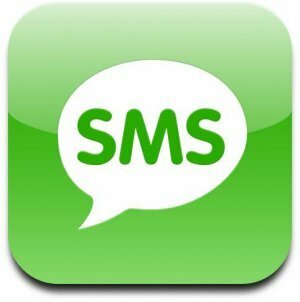 Contact your network administrator or the owner of the remote computer for assistance. Do you want to connect anyway? when I saw the message, I thought that may be because of active directory membership, since before formatting my laptop I was member of the domain and after reinstalling I tried to connect to server before joining the domain. so I joined my domain first and then tried to connect to server using the Remote Desktop connection, still it showing me same message. when you try to connect with remote desktop from vista to windows server, vista asks for authentication, but at server side in 2003 server there is no process to provide authentication, it refuses the request so the warning message appears. this will get solved in upcoming server "windows server 2008" or codename longhorn which has Terminal Services Gateway. 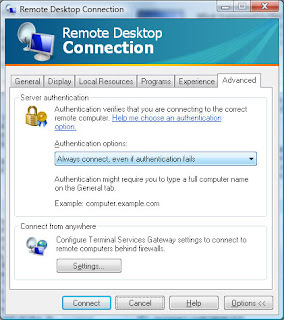 click on the advanced tab in the Remote Desktop Connection tool and change the Authentication options to "Always connection, even if authentication fails". and If you want to set this at the server level then you need to play with registry and make some changes in authentication level read more about this at Scott Forsyth blog.